Install the resource adapter into Weblogic 12c. Weblogic is expecting an ra.xml configuration file describing the resource adapter instantiation parameters and the connection factories definitions. The factories definitions included therein are abstract. They do not refer to any instantiation parameters. Download here a sample of a correct resource adapter configuration file. 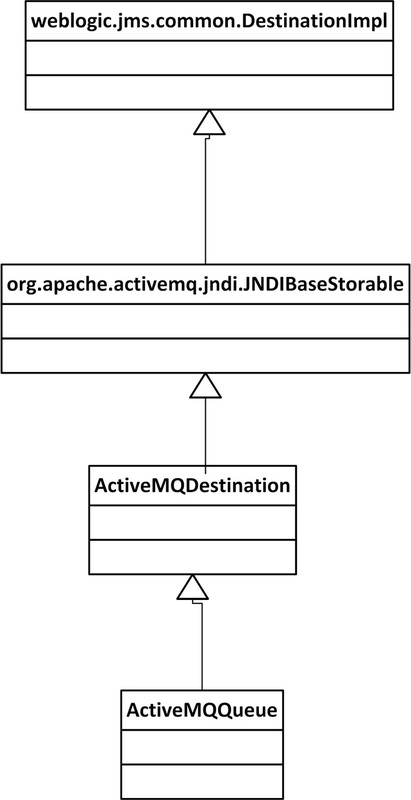 Patch activemq-ra-5.11.1.jar with the modified class org.apache.activemq.ra.ActiveMQManagedConnectionFactory. Make sure the jar inside the rar archive are copied again into the lib directory of the Weblogic domain. Instances created by these factories need to be specified in weblogic-ra.xml. Most important the connection factory defined therein must match a defintion found in ra.xml. Unfortunately the recovery of the connection destination carried out by the weblogic container casts for some reason the JMS destination to weblogic.jms.common.DestinationImpl. Hence, it prevents plugging in foreign broker into Weblogic. 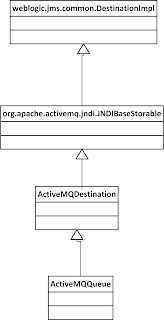 To overcome this, it is up to you to inherit the ActiveMQDestination directly from the weblogic DestinationImpl. Create a jar file com.oracle.weblogic.jms _patch.jar containing the mofied class weblogic.jms.common.DestinationImpl. Make sure the jar inside the rar archive are copied again into the lib directory of the domain. 3. Install the resource adapter into Weblogic 12c. Make sure both the resource adapter configuration files, ra.xml and weblogic-ra,xml lie under META-INF. Deploy the rar archive as an application to Weblogic. To instruct the ActiveMQ console to which broker to connect to you need to set system properties into the JVM on which the web console in running. In our case, as we are dealing with in-memory broker, it is the same JVM of the same managed server the broker is running onto. Deploy the activemq-web-console-5.11.1.war to the same Managed server where the in memory broker resides.